16-bit System-on-a-Chip for learning, teaching and having fun. 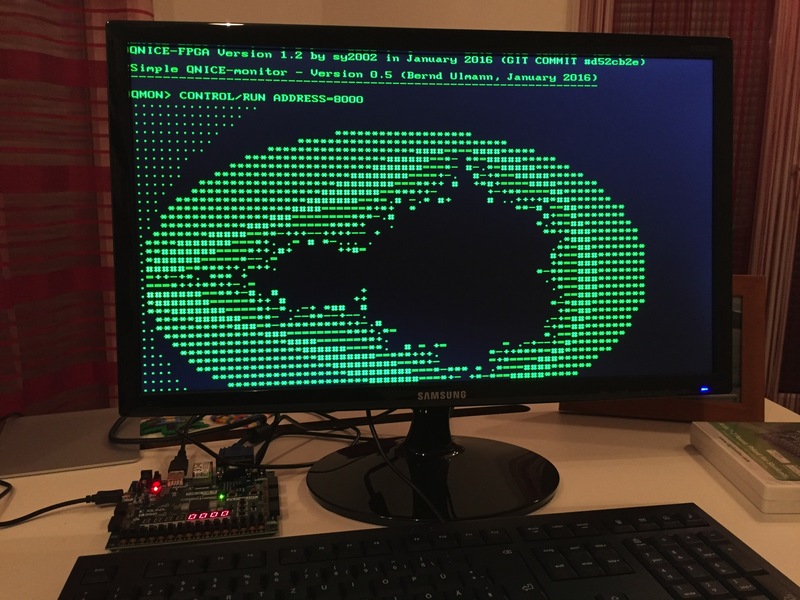 QNICE-FPGA is a 16-bit computer system build as a fully-fledged System-on-a-Chip in portable VHDL on a FPGA. Everything - from the hardware design in VHDL to the toolchain (assembler and C) is Open Source, so you can start hacking right away. Currently, we are developing QNICE-FPGA using a Nexys 4 DDR FPGA development board. We recommend using it, too, since this will greatly speed up things for you. You need a Bash Shell and GCC or CC to work with our toolchain. macOS and Linux work out of the box. On Windows, you might want to install the Ubuntu Bash on Windows 10, or work with MinGW. If you are using a Nexys 4 DDR, you are ready to go with the pre-synthesized Bitstream that is part of our GitHub repository. If you would like to synthesize the hardware by yourself, then we recommend using the free Xilinx ISE WebPACK, all necessary files to work with ISE are already part of the GitHub respository. As the VHDL code is written in a portable way, feel free to synthesize with any other tool for any other FPGA. If you are using a Mac, the optimal setup is running Xilinx ISE under Windows in Parallels and then working with the rest of the toolchain directly in the macOS Terminal. For connecting with the UART of QNICE-FPGA, we are recommending to use Serial. A step-by-step tutorial of how to get started is available in the README.md of our GitHub Repository, so CLICK HERE TO GET STARTED. sy2002: Creator and maintainer of QNICE-FPGA: hardware development (VHDL), FAT32 library, additional Monitor libraries and functions, Q-TRIS, additional QNICE specific vbcc toolchain. vaxman: Inventor of the QNICE ISA: system architect, assembler, emulator, Monitor and Monitor libraries, tools. Volker Barthelmann: vbcc compiler system, QNICE specific vbcc backend incl. standard C library.